In the past, people had to just accept their appearance as a result of this disease. Luckily, today’s medical and cosmetic surgery techniques can give someone with Thyroid Eye Disease a new lease on life. If you have been diagnosed with Thyroid Eye Disease, you may be a candidate for orbital decompression surgery or eyelid retraction repair surgery in St. Louis to restore a more normal eyelid appearance, as well as normal eye function. Thyroid Eye Disease is sometimes called Thyroid Orbitopathy and Graves’ Disease. It is a result of an autoimmune disorder in which the body attacks its own thyroid gland. The disease can start suddenly, causing inflammation that eventually results in bulging eyes (proptosis), a condition called thyroid exophthalmos. The bulging contributes to a retraction of the upper eyelids and the lower eyelids. Other possible symptoms of the disease are excessive tearing or dryness, irritation, pain, redness, double vision, and vision loss. When you arrive, you will need to provide a medical history, as we need to know about major illnesses and problems such as heart disease and hypertension. We need to know details of your thyroid history, including prior treatment and current thyroid hormone levels. Prior surgery, especially facial surgery, is also important. Medication history, including medications or supplements that thin the blood are vital to disclose. All over-the-counter pain/fever reducers (except Tylenol) and non-steroidal anti-inflammatory drugs (NSAID) are off limits for a week before eyelid surgery. Herbal medications such as ginkgo biloba and St. John’s Wort or high doses of fish oil, flax seed oil, or vitamin E must also be avoided. Most patients with eye changes due to thyroid eye disease do not require immediate surgery. In most cases, it’s necessary to allow the disease to stabilize for 6-18 months before considering surgical correction on an elective basis. Dr. John Holds will ask you about what aspect of your eyes, eyelids, and face bothers you and will discuss the best options for you. A mutual understanding of the goals, expectations, and outcomes is essential to a great result! An examination is performed to look at any eye condition such as dry eye, as well as eye position and alignment, that could result from thyroid eye disease or alter the surgical plan and become a possible concern after surgery. As a board-certified ophthalmologist (eye surgeon), as well as an ophthalmic plastic surgeon, Dr. Holds is attuned to eye diseases and concerns and is routinely referred patients with thyroid eye disease. During the period you are being followed by Dr. Holds, it usually becomes clear whether you need to first undergo an orbital decompression procedure to allow the eye to move back toward its normal position. In this procedure, fat behind and surrounding the eye and/or bone is removed. This sounds like a great thing but is only necessary in a small percentage of patients with thyroid eye disease. The potential risks and complications are greatest with this sort of surgery, and it is reserved for the most severely affected patients. The next consideration is whether you have a misalignment problem with your eyes that requires treatment. Most commonly, this produces some double vision which can be very troublesome and debilitating. Once again, we must ensure that this condition is stable before considering any surgical correction. Next, eyelid retraction must be considered. This is often treated on a medical basis to decrease eye exposure symptoms or on a cosmetic basis to improve appearance. Upper and lower eyelid operations are possible and appropriate for certain patients. The final issue in patients who have cleared all of the above hurdles is to resolve specific cosmetic issues. These concerns are often addressed by additional treatments that are not medically necessary but which are helpful in order for you to look your best. If left untreated, severe cases of Thyroid Eye Disease can cause permanent vision loss. The active disease eventually subsides and stabilizes, although this can take months or years. 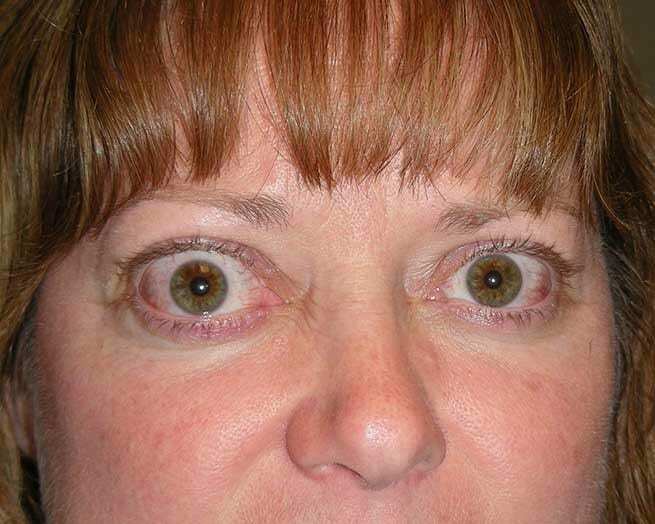 Some degree of the bulging of the eyes and eyelid retraction is generally permanent, changing your appearance. You cannot have surgery until after your disease has completed the inflammatory phase and has stabilized. If you need orbital decompression surgery to correct the globe position of your eyes, as well as correct a visual loss problem, you may have to stay overnight in the hospital. If your surgery is done primarily to restore more normal eyelid appearance, you can have the procedure on an outpatient basis. The surgery lasts 1-3 hours, during which your upper eyelids are lowered to normal position and/or your lower eyelids are lifted back to a more normal position. After your surgery, ointment is placed in your eyes. You will be asked to use artificial tear drops and an antibiotic ointment several times a day for about a week. A mild to moderate painkiller is also occasionally needed. You may be given a prescription for antibiotic tablets as well, and you will see Dr. Holds or his associates again about a week after your surgery. You will probably experience some bruising and swelling for several weeks, but most people experience minimal discomfort and can return to work within two weeks. If you have been diagnosed with Thyroid Eye Disease or eyelid retraction, call our office at 314-567-3567 for a consultation to discuss restoring the proper appearance and function of your eyes.